Those over 65 and retired are relying strongly on the New Zealand Superannuation pension income (86%). Research by Horizon for the Financial Services Council, finds they are drawing on up to 15 other sources of their wealth. Ten income streams, the top ranking of which are savings account interest (48%), bank term deposit interest (43%) and withdrawing some of their savings and term deposits (31%). Some 19% are receiving share dividends and 11% income from bonds or debentures, while 10% use KiwiSaver funds and 9% money from superannuation schemes other than-KiwiSaver. Asset sales: 26% are selling residential properties, 8% shares, 7% debentures, and 36% other assets. Some 38% say they are getting income from “something else”. 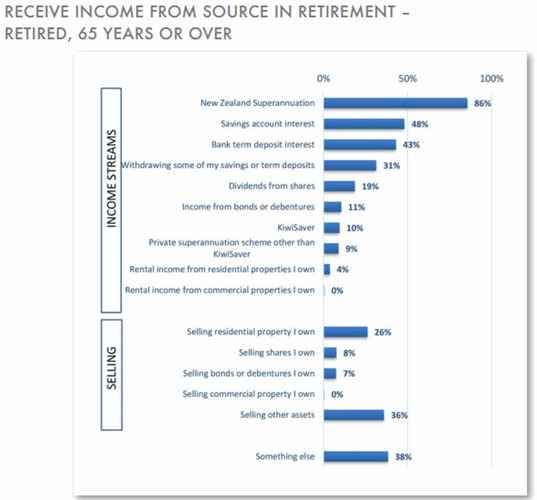 On average, after New Zealand Superannuation, the highest amounts received weekly from these sources by those 65 years or over who have these assets are coming from residential property rents ($360) and private super schemes ($295). The most common non-property asset, savings account interest, delivers between $0 and $50 a week for 85% of those with a savings account. About 43 in every 100 of those aged over 65 and now retired have been in KiwiSaver. The obligation to remain a member ends at 65. The most common practice among those 65+ is to withdraw all their funds from the scheme: 21% have. So have 22% of those who are still employed but 32% - around 11% of all those 65+- are still contributing and 22% - around 8% of all 65+ respondents - have not withdrawn any funds. When asked overall if they feel they are managing their assets to make sure they have the best possible income in retirement, 77% of those aged 65-74 say they’re “managing well, thanks”. This rises to 80% of those aged 75+. However, many do want more advice. Nearly four out of 10 people aged over 65 – the equivalent of 229,500 people - wished they had sought more financial advice. However, 45% (272,600 people) think they had the right amount of advice. 19% of KiwiSaver members 65 years or over want their provider to give them advice on how to invest their funds and 22% want providers to tell them more about options to draw down funds. Among the whole 65+ population, one in five, equivalent to about 120,800 people, want advice on drawing down savings and managing assets, like property. If the Government changes the law to make it “technology neutral”, so personalised advice can be provided by electronic services (robo-advice) including online (not just from people who are qualified financial advisers), then 47% of those over 65 will use them. That’s equivalent to about 285,900 of this age group. Mostly they want advice on full financial plans, insurance and creating a regular income stream. You're welcome to comment on our Facebook page.